A cake order form might be indicative of the name, is used to place an order for a cake or cakes with a bakery or person who offers his/her cake baking services. The form allows the customers to make an informed choice when placing the order, with the various flavors and icing offered listed in the form. It also makes it easier for the baker to meet the customer expectations on the stipulated date. You may also see Purchase Order Forms. 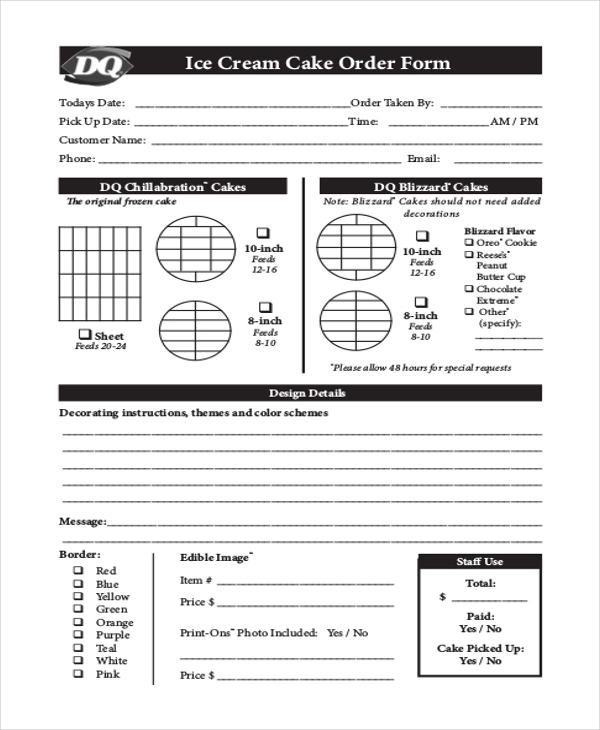 This is a sample of how a cake order form should ideally look. It comprises of important subheads which the user can change as per his requirements. 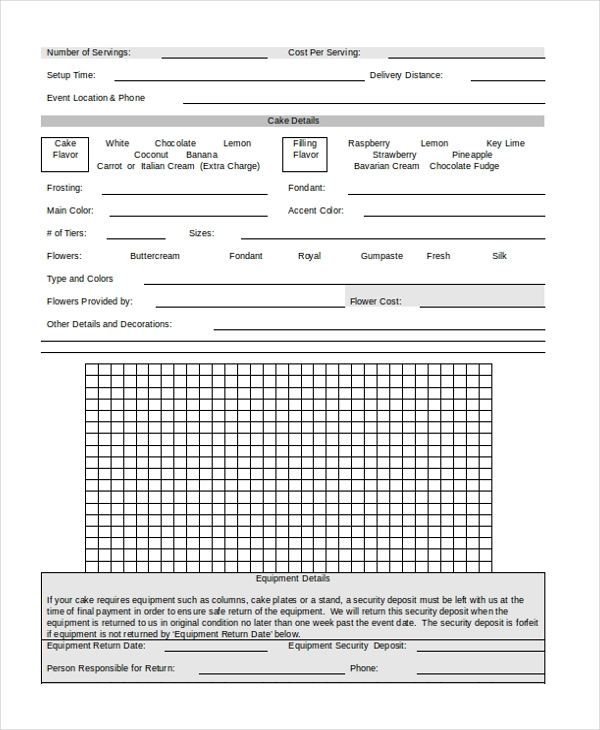 Any person who intends to place an order for a wedding cake is required to fill in this form with the details of the cake and expected date of delivery. 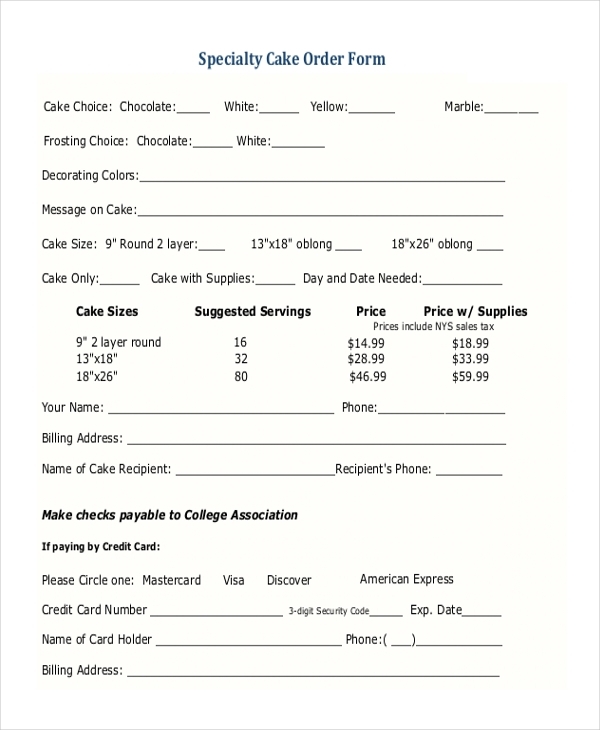 This is a standard cake order form that can be used by any person after customizing it. With important segments in place, personalizing this form becomes quite easy. 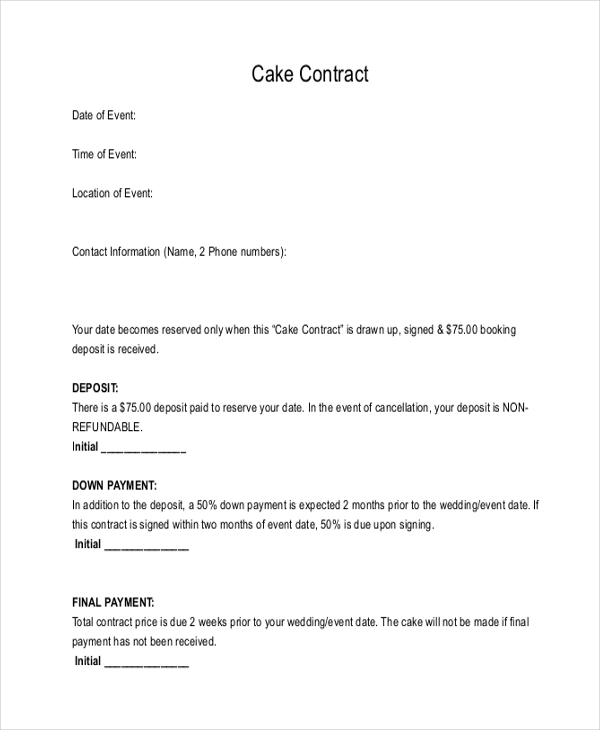 When a customer places an order with a baker for a cake, the two parties can sign this form to get into a formal agreement. The form consists of the details of the cake, date of delivery and any terms agreed by the parties. 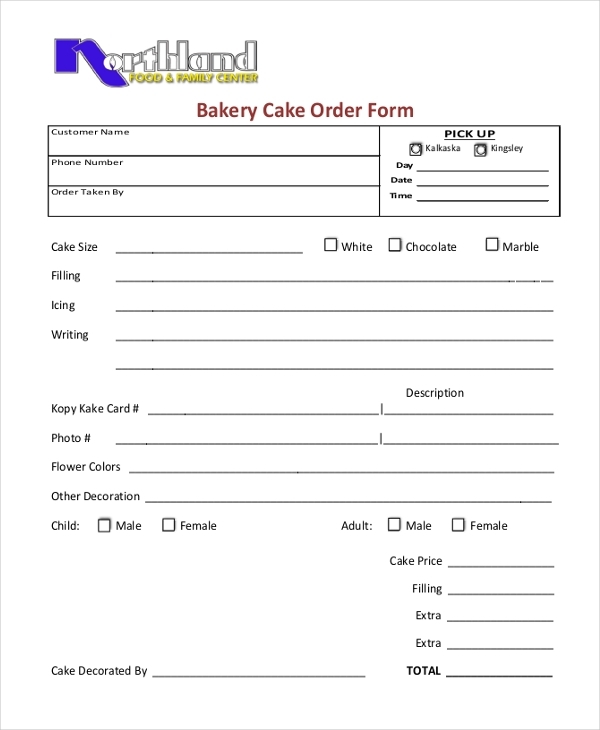 This form is used in a bakery to allow its customers to place an order for a cake. 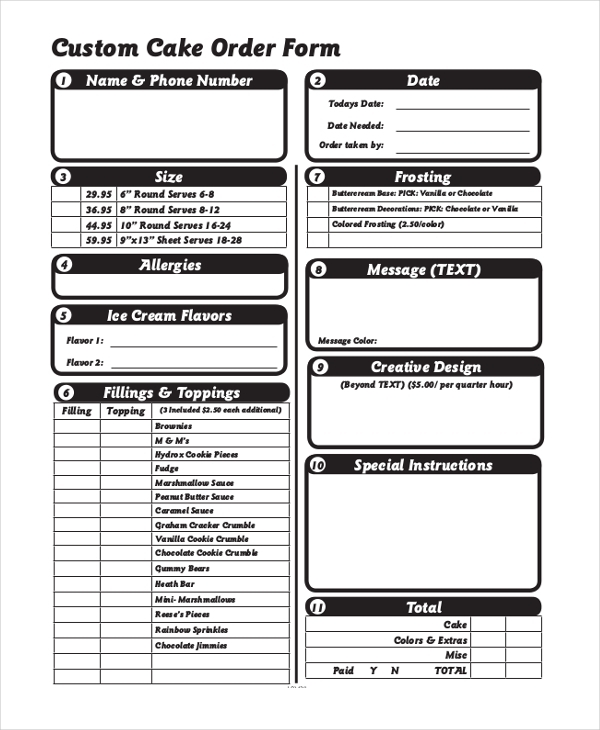 The form lists down all the flavors and icings the bakery has to offer making it easier for the clients to take a pick. 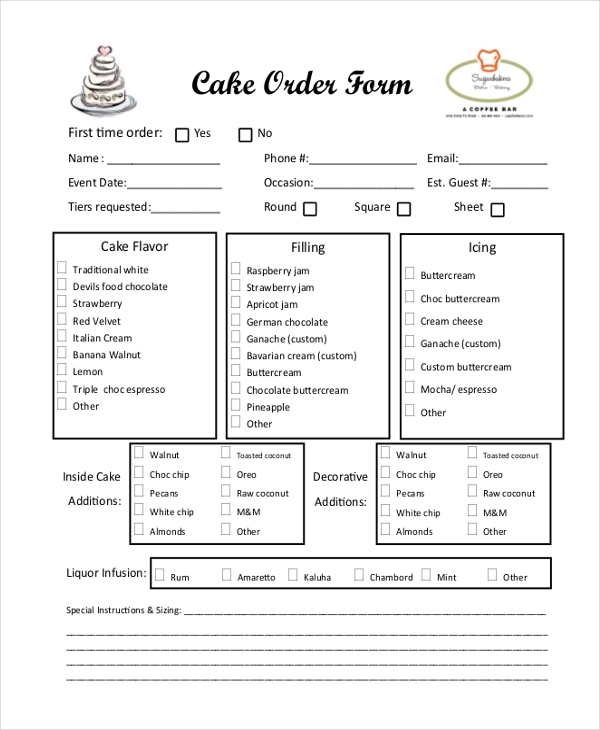 This form gives the user an idea of what the format of a cake order form should be. The user can even customize this to use it as a cupcake order form. 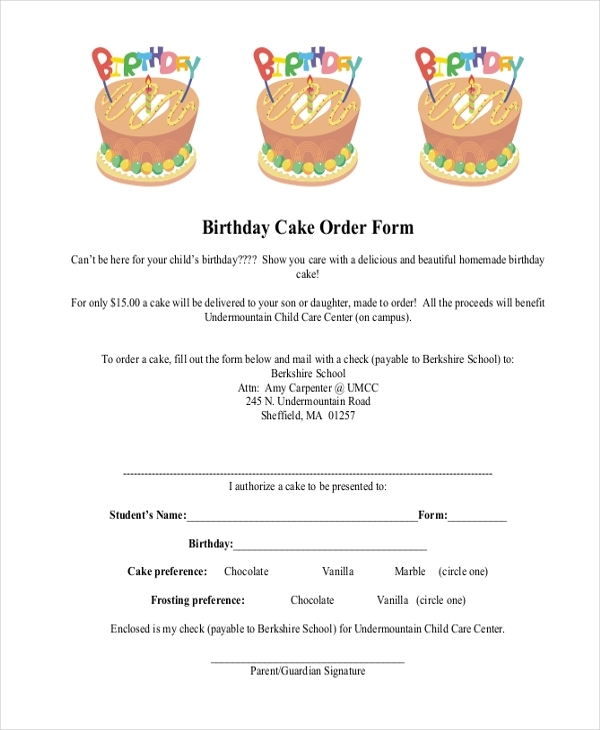 Used by bakers and bakeries to enable the customers to place an order for an ice cream cake, this form comprises of the detailed lists of flavors on offer, thus simplifying the order process. Any person intending to place a birthday cake order form is required to fill in this form with all the details like date of delivery, flavor and icing, quantity, personal details etc. As the name indicates, this form is used by a bakery to make it easier for its customers to place an order for a Christmas cake. The customer is required to fill in relevant details in the form. 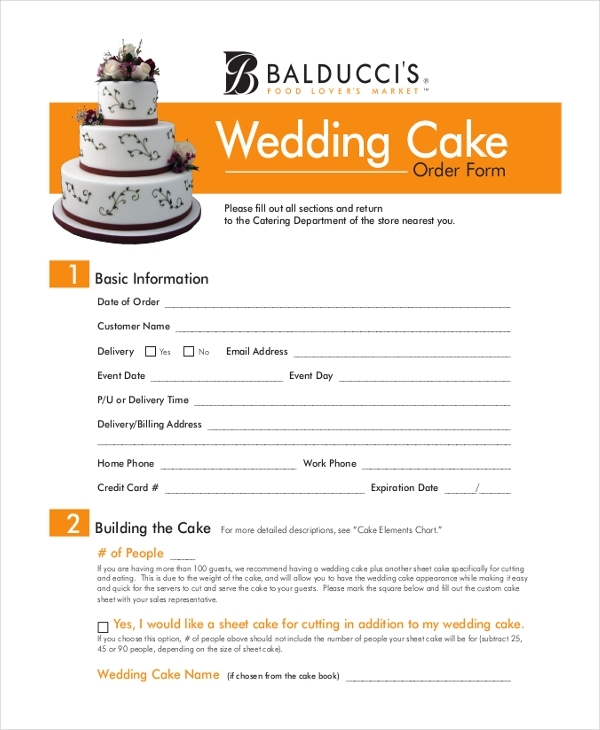 Whenever a customer requires a baker to bake a customized cake, the baker expects him to fill this form with all the details including the customer’s expectations. What are Benefits of Using Cake Order Forms? 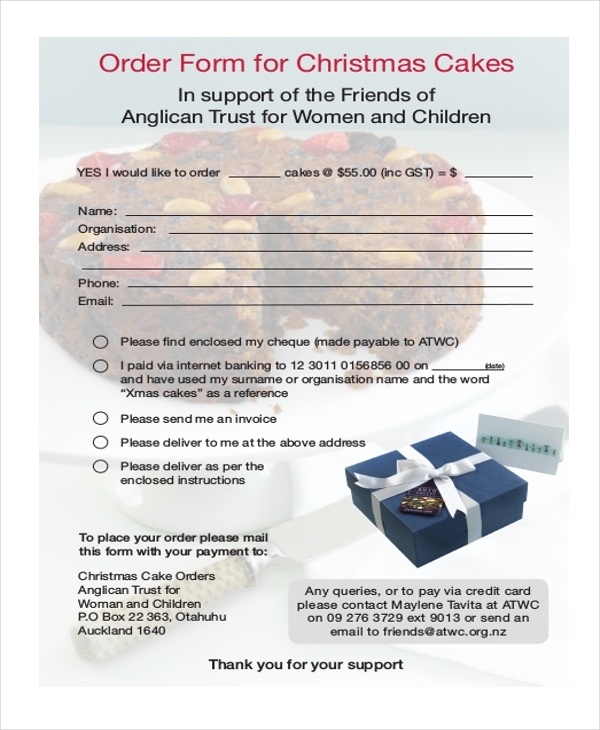 How to Format a Cake Order Form?